Instead of playing into the drama, why not make your home set‐up a point of calm amongst the chaos, and set your children up for success by creating (or updating) an incredible homework station. 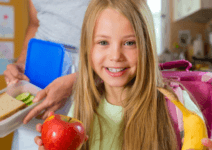 Teaching your kids how to keep themselves organized is such an important skill. Tasks such as time management, tidying workspaces, and project preparation will not only help them with school work, but also with life and the challenges it brings as they continue to learn and grow. 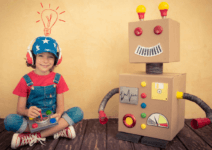 As organizers, we have used these tips to create homework stations for elementary school aged children onwards and they can easily be applied to families looking to refresh their existing systems for kids of any age. And big bonus — your kids will love their new work space so much, they may actually be excited to do their homework! PIN for when you’re ready to organize! First things first, you’ll need to find a room or space in your home that works for your child. Depending on their age and how much assistance they require, this spot could be in a communal room (think kitchen or family room) or at a desk in their own room. The ultimate goal is to get them working in a proper set‐up with a table and chair instead of working from their lap – this way they establish good habits, can properly work on their handwriting and have room to spread out all their materials. Homework Station for 4 via Householdno6. 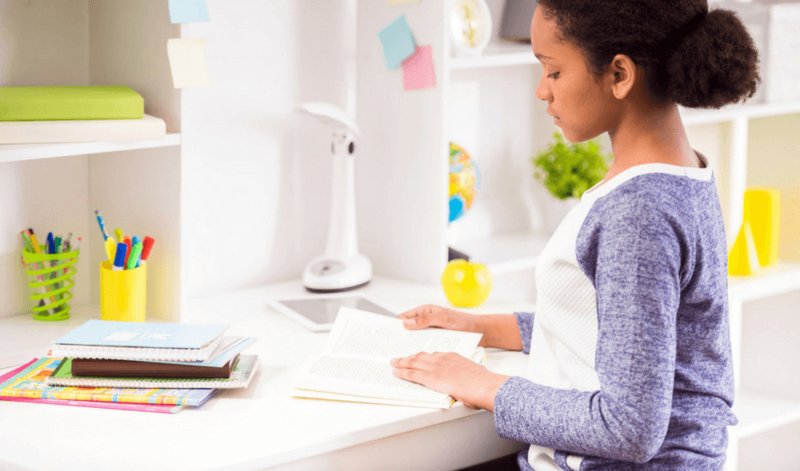 Now, if finding a dedicated desk space isn’t possible, consider making your own mobile supply station that can be easily moved in and out of the space (like the kitchen table) when it’s homework time. 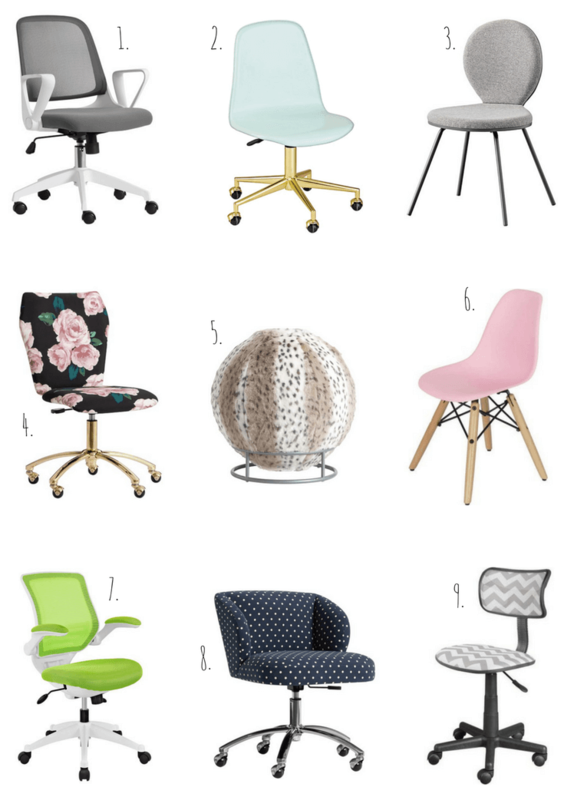 Select a good desk chair that is both comfy and supportive. You don’t want a chair to be the reason that your kids are gravitating to doing their homework on the couch! Although it may seem obvious, having a trash/recycle can near their desk will encourage them to not only throw out their old papers, but also (perhaps with a little coaxing), to purge the garbage from their backpacks on a regular basis. Hang up a cork, magnetic or pin board for your kids to put papers, reminders and a calendar. This is a space that should be within reach of their desk so they can easily add/remove important items on a regular basis. It can also give them a chance to decorate and personalize their space — hopefully inspiring them to actually use it! Having supplies within reach of the workspace is key to their productivity (there needn’t be twelve trips around the house looking for the tools they need to complete each project!). 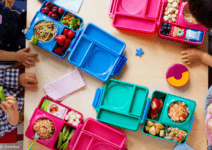 A version of these supply caddies can also be made for the road as there are often times that your child won’t be home when it comes time for homework (ie. at a sibling’s after‐school sporting event!). Capitalize on that travel and waiting time with a to‐go bag of their most needed supplies. We especially love this portable storage one. Make cleanup easier on everyone by using labels on your supply containers/caddy. This will help teach your children how to maintain their space and hopefully put an end to the continuing cycle of them asking where to put things when they are cleaning up. We love this no‐fuss, inexpensive labeler and also check out these cool reusable chalk board labels. As your kids get older, homework will often require the use of technology, which means cord and charging chaos! 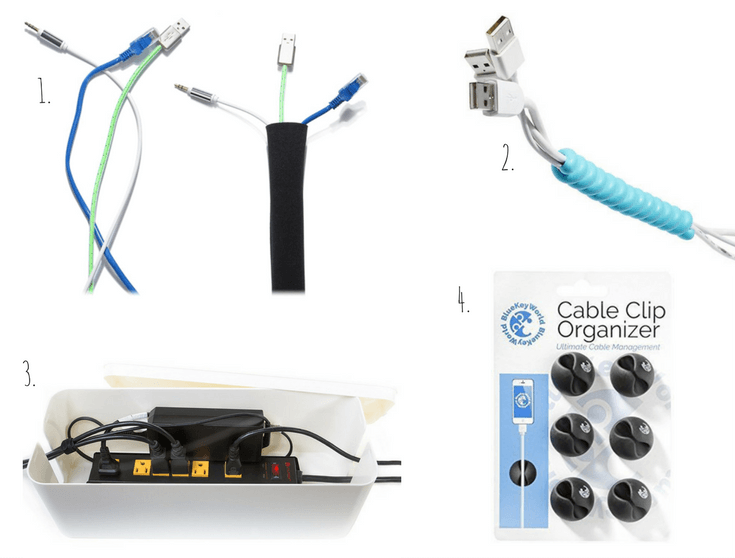 Keep their space tidy from the cord clutter by using some of these ingenious products and hacks to help cables stay neat and handy for when it’s time to plug in and charge. Give them the tools to manage their own time by keeping a clock or timer at their workspace. Setting time limits for each subject can help them stay on track and is a life skill that will bode them well in life after school. If you haven’t heard of the Time Timer before, it is an ingenious tool that visually shows your child how much time they have left for a certain task. It is easy for them to set themselves, and they don’t need to know how to read a clock in order to understand the concept of time diminishing. Help keep your child’s different subjects organized with color‐coded file folders (1) — for instance, green for science, blue for english, etc. 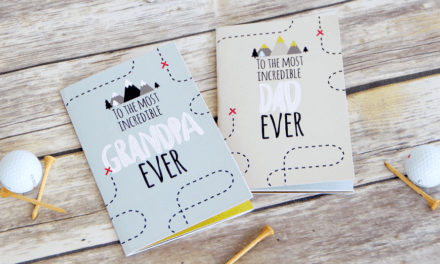 — so they can keep their notes organized on their desk and in their book bag. A simple file folder organizer can help keep their most important documents at arm’s reach (this one (2) even has some extra storage underneath!). If there’s not enough room on your desk for one, try this nifty cascade folder (3) that you can hang on the wall when working, and collapse and bring with you on‐the‐go! There’s always a plethora of school paperwork and updates that need to get safely into your hands. Consider setting up some in and out bins where your kids can drop off any papers that need to be signed or seen by a parent. You can then go through them each night, and put any that need to be returned to school in the “out” bin, ready for them to pick up in the morning and pack in their backpacks. With a little practice, this can be an extremely effective method that can be used all the way through high school! It is vital for older children to start learning how to manage their own calendar. Whether it’s a desktop planner, or a large dry‐erase calendar that can hang on the wall, it’s a great way for them to visually see what tests and assignments are coming up, so they can manage their time accordingly. Now you’ve got their work space expertly organized, help your child form a routine of when they do their homework. It could be as soon as they come home after a snack, after ½ an hour of “down” time or after dinner. Whatever you decide, help them stick to their routine for the first few weeks by setting a timer or providing gentle guidance. Hopefully with their new homework station in place, they’ll feel a real sense of ownership and be excited to get down to work! After their homework is complete, consider helping them put a routine in place that will help make the morning rush less hectic. It could be as simple as establishing a nightly backpack check ensuring that all the books and papers needed for the next day are all packed away. Or having them place their packed backpack in a designated space (preferably near the door!) so there isn’t a mad scramble to find it in the morning. So there you have it mamas, tons of tips and inspiration to create the ultimate Homework Station. We wish you much success in the homework drama and hope you’ll never have to ask “is your homework done?” ever again! 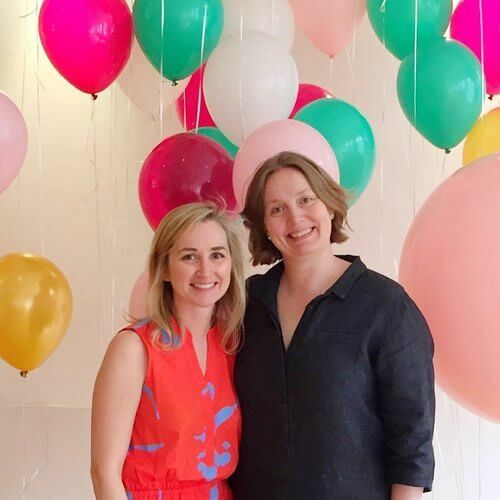 Michelle and Annie are co‐founders of Henry & Higby, a professional organizing company in New York City. They believe that life should be as simple as possible and that the process of getting organized can help. Wow, these homework stations are amazing! Almost too pretty to work at. Haha. I like the wall organization ideas the most. Always good to get stuff up and off the desk! Wow, this post is pack full of good ideas! I think it is so important to have a fun, bright station that get kids actually excited to do their homework! Beautiful post. So much inspiration here!!! My oldest just started kindergarten but I want to have good habits established early and these ideas are great! Always such helpful posts! Thank you!